A delegation from the Danish Energy Agency (DEA) headed by Mr. Anton Beck, Head of Division for Global Cooperation, and Dr Engineer Sileshi Bekele Minister of Water, Irrigation and Electricity of Ethiopia (MOWIE) have officially signed the Implementation Partnership Arrangement, which covers Government-to-Government Cooperation under the “Accelerating Wind Power Generation in Ethiopia” Programme (AWPGE) between Denmark and Ethiopia. The AWPGE Programme is a joint undertaking between MOWIE, Ethiopian Electric Power (EEP), Ethiopian Energy Authority (EEA), the World Bank, the Danish Energy Agency, Energinet.dk, and the Royal Danish Embassy in Ethiopia. The Programme is funded by the Danish Climate Envelope. 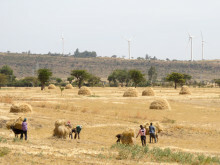 The main scope of the Government-to-Government Cooperation under the AWPGE programme is to promote a mutually beneficial partnership between MOWIE and DEA in the renewable energy field, supporting Ethiopia’s target of expanding wind energy from currently 324 MW to approx. 5,200 MW before 2020. The cooperation programme includes the realisation of the first Ethiopian Independent Power Producers (IPP) wind auction of 100 MW with the scope of establishing and strengthening framework conditions for IPP wind tendering processes going forward. 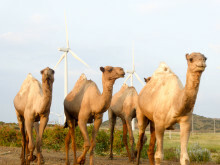 Of the planned 5,200 MW of wind capacity Ethiopia plans that 3,600 MW will be built by IPPs. 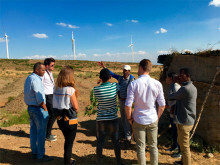 DEA along with the Danish Transmission System Operator Energinet.dk, will also support the development of a solid system integration strategy of wind power into the Ethiopian grid, assisting the Government of Ethiopia in optimizing energy dispatch strategies to balance intermittent energy sources. 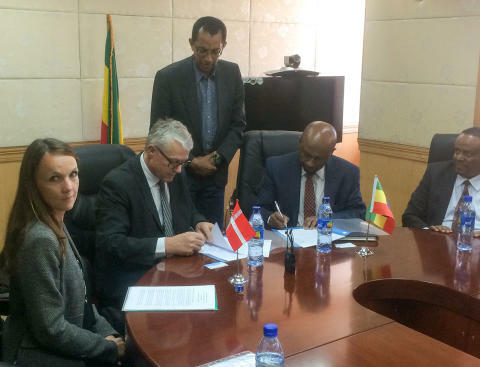 For ensuring an efficient coordination from the involved Danish institutions, a Danish Energy Advisor will be also positioned within MOWIE to provide expert assistance on policy and strategic issues of large-scale wind power development in Ethiopia. After the official signature of the programme, the Ethiopian key stakeholders and the delegation of DEA will enter into discussions for enforcing detailed work programmes and activities, which will constitute the solid base of the implementing partnership programme for the next three years. Special Advisor Henrik Breum, Danish Energy Agency, tel: +45 33 92 78 12, e-mail: hebr@ens.dk.